The name Frye elicits a certain feeling of classic American wardrobe staple. A well made leather boot that will wear for years and years and always be in style. I really want a pair. 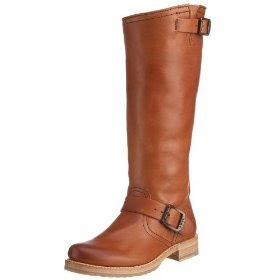 But since Frye's average price point is $300, I'm left feeling high and dry. Even on sale the knee high styles nary dip below $100. So I though I might try ebay. While ebay always has a decent offering of NIB items, I wouldn't be opposed to a 'gently worn' pair if it would get me a pair of Frye boots for under $50. Unfortunately the general trend of previously worn frye boots end with auction prices from $80 to $200! Am I alone in thinking that is absurd? We are talking about shoes that other people have worn! What makes last season's used Fry Boot worth half it's retail value, when you could buy a new pair of leather boots from Aldo for the same price? Is it so wrong to think that once worn, the resale value drops to the thrift store price of $15? Am I really the only person to think that used boots are worth that much? I think asking for $200 for your used boots is absolutely absurd. I have one pair of Frye boots (biggest splurge of my life) and I can definitely see why they're so expensive originally. They're beautifully made from very high-end materials. A friend of my father's told me that while he didn't like the boots (pssssh), he would have killed for the leather they were made out of. But I totally agree- once worn, their price point should drop significantly. That's just ridiculous.